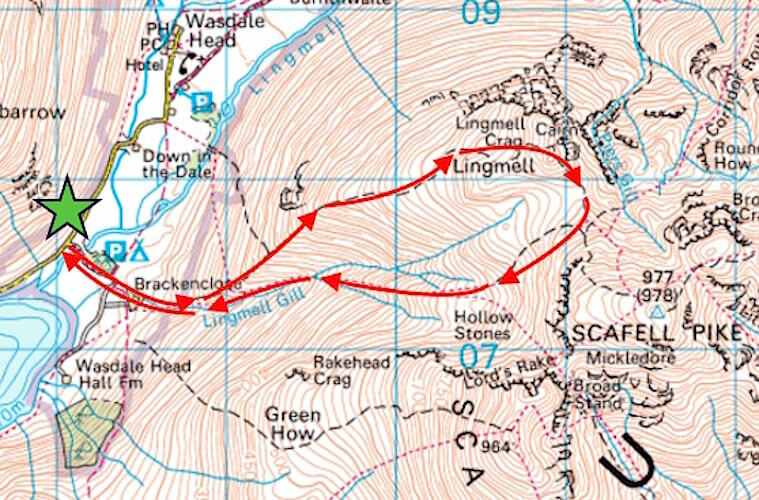 My memories of this walk are a little sketchy after all these years, mostly I remember it being a long and dreary trudge up a steep grassy slope. 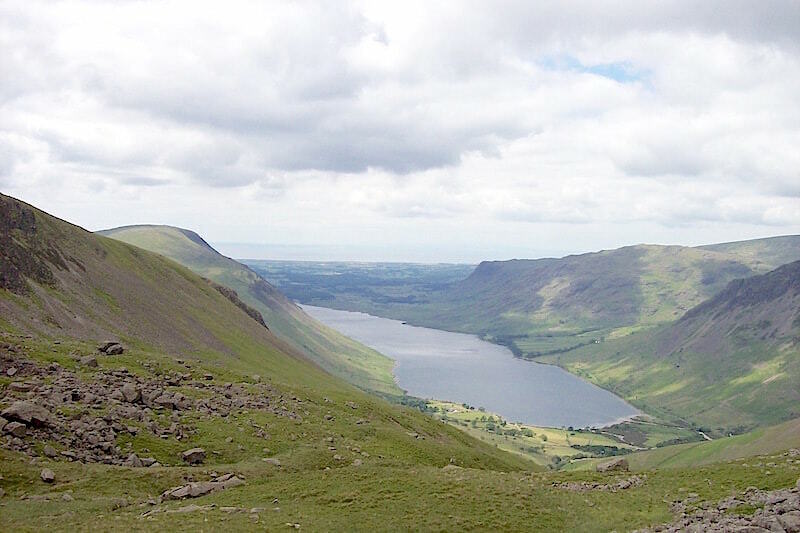 For most of the way the only views ahead of me were of the grass and stones on the steep climb to the summit, which was out of sight for the majority of the climb.The view behind was this grand one of Wast Water and, of course, it didn’t change all the way up. Still, it was nice to look at when we stopped for a breather, which was quite often as I recall because, in addition to the steepness, the conditions were quite muggy and close. 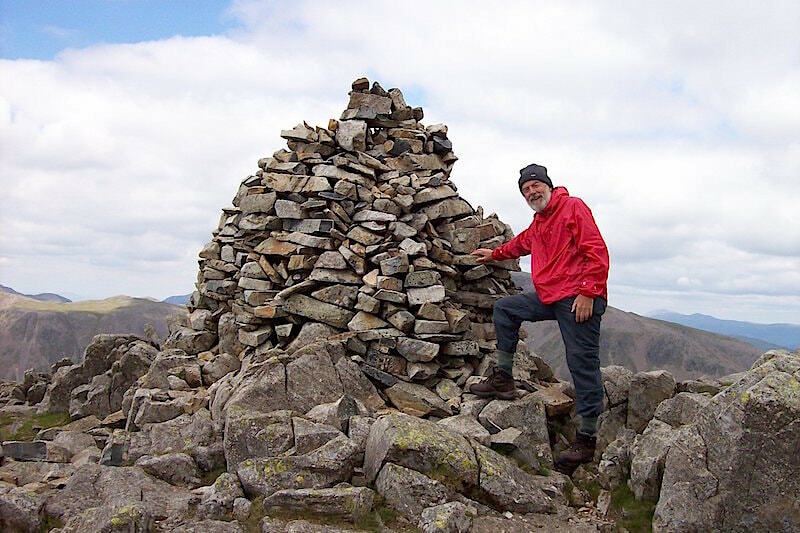 The views begin to change when we are almost at the summit. 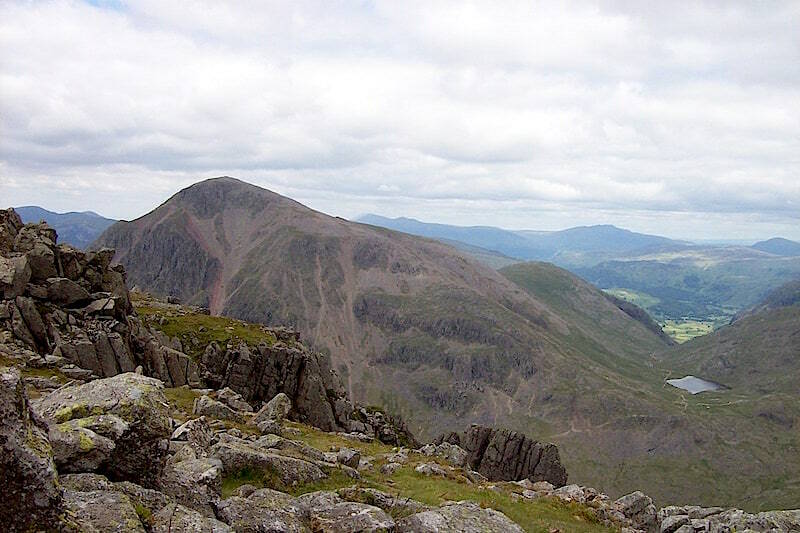 This is the view across to Mickledore over to our right, its the gap between Scafell Pike, to the left, and Scafell over to the right. Although it looks as though you could walk over from one to the other it just isn’t possible thanks to the presence of that big wall of rock on the right of the shot. 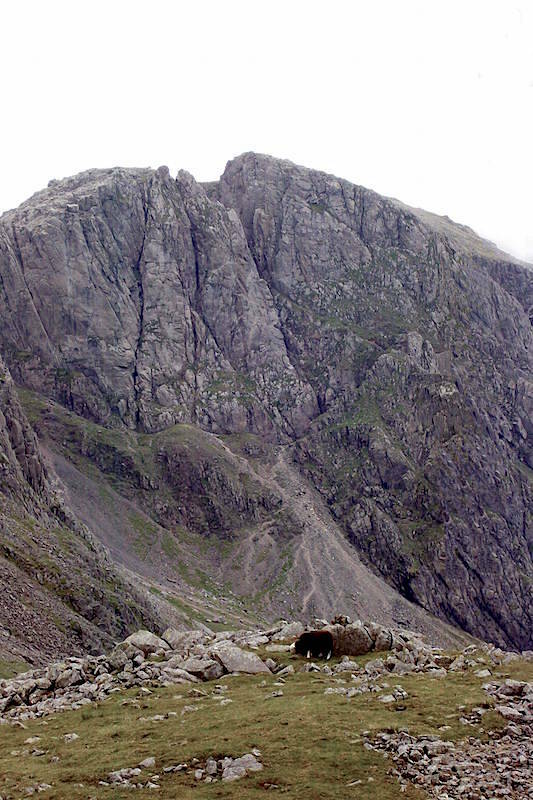 That’s Broad Stand, and its a climb not a walk, where climbing gear becomes necessary in order to get up and over it. 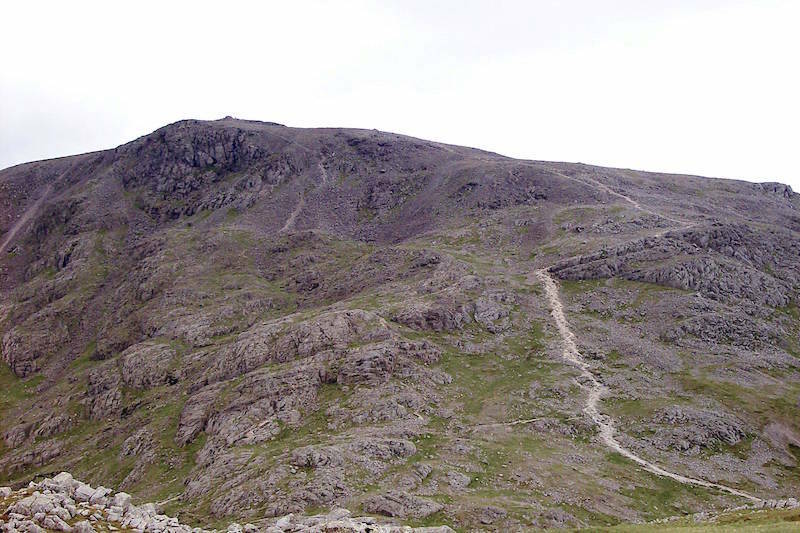 We once used the Mickledore route when we went up Scafell Pike, very loose scree underfoot so it was rough going all the way up to the col. 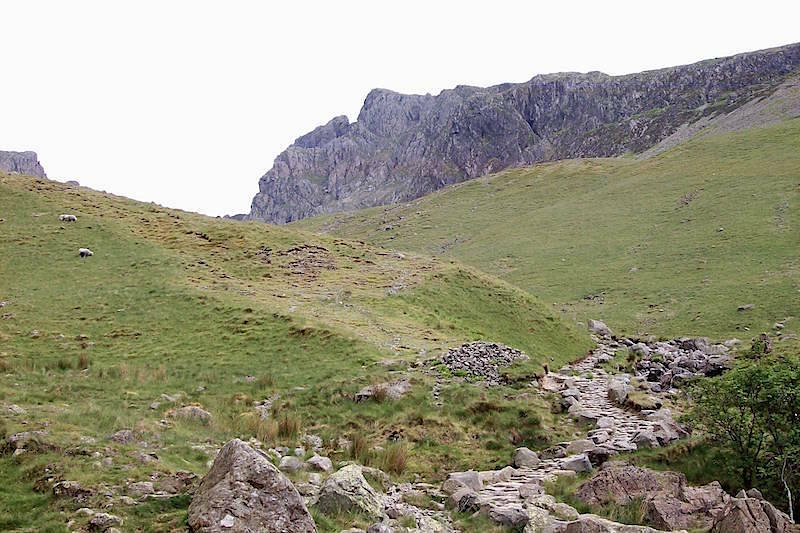 Looking back down at the rising slope on Lingmell, that’s why the view ahead of me was simply of a steep, green hill. 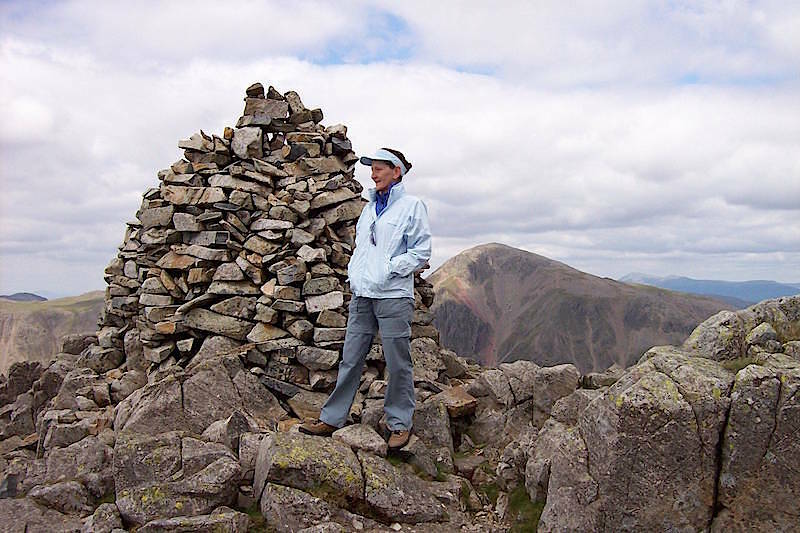 On the summit of Lingmell with the steep scree slopes of Great Gable behind. Extra layers went on up at the summit as it turned ever so slightly nippy in the breeze. 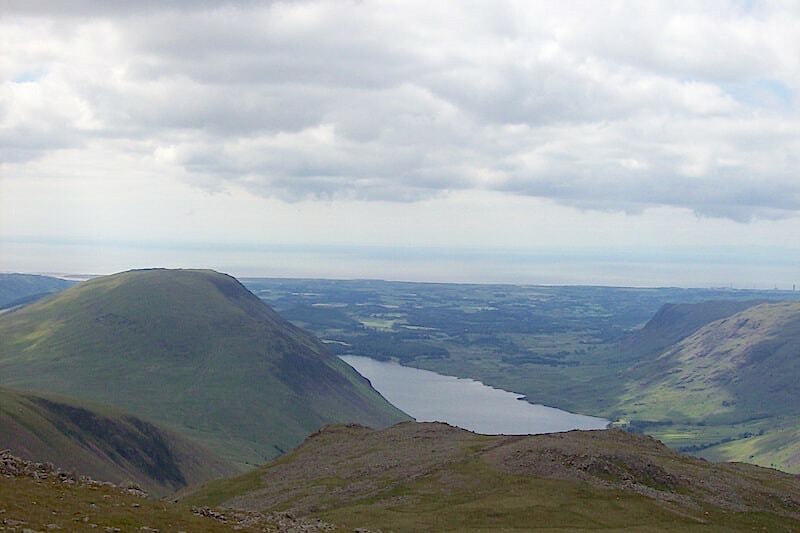 A better view of Great Gable with Styhead Tarn to the right of it. 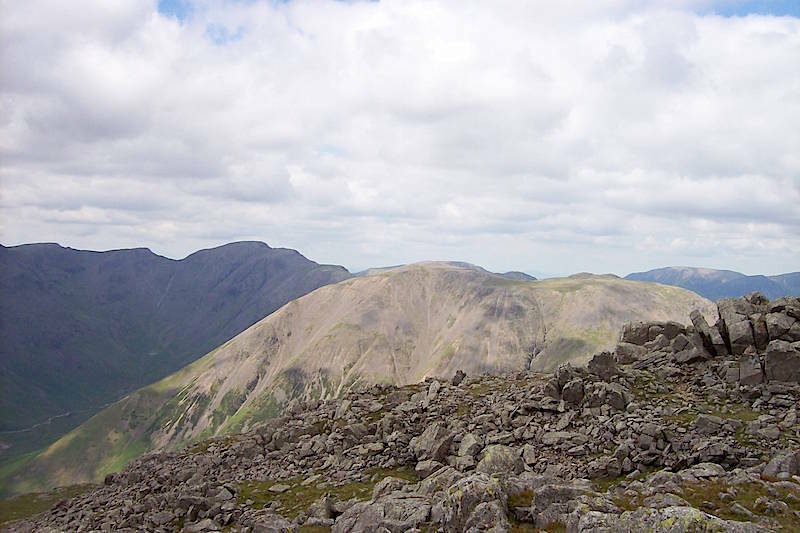 Looking across the col to Scafell Pike. The camera is up to its old ‘purple’ tricks again. 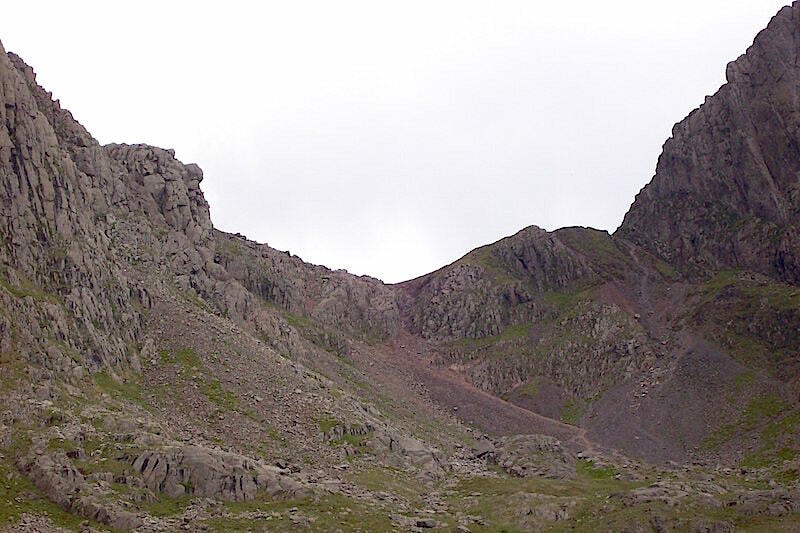 From Lingmell a close up view across the lower slopes of Mickledore over to Symonds Knott. 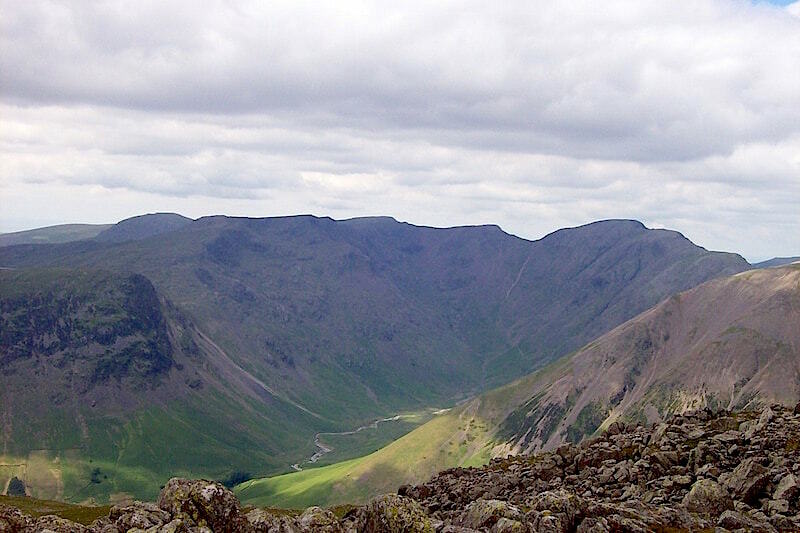 The Mosedale Horseshoe from Lingmell. Kirk Fell gets a splash of sunshine, Pillar and its neighbours just behind it stubbornly remained in the shade. 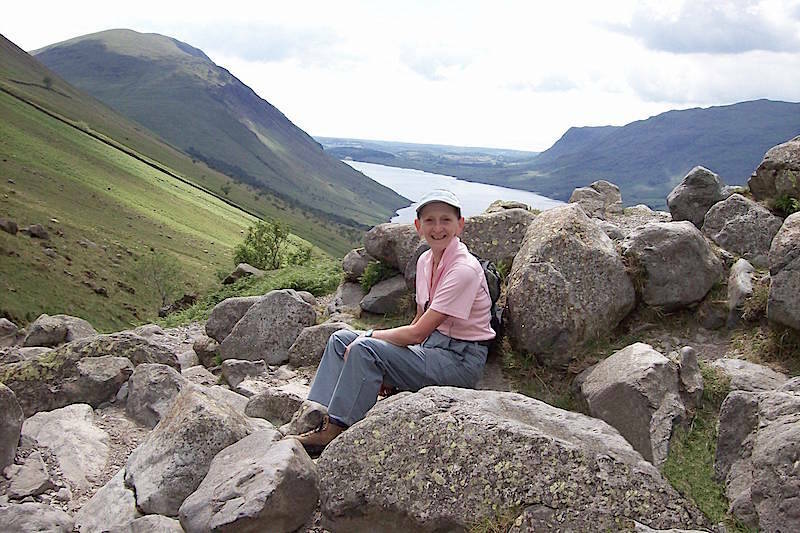 A look back as we make the descent to Wast Water. 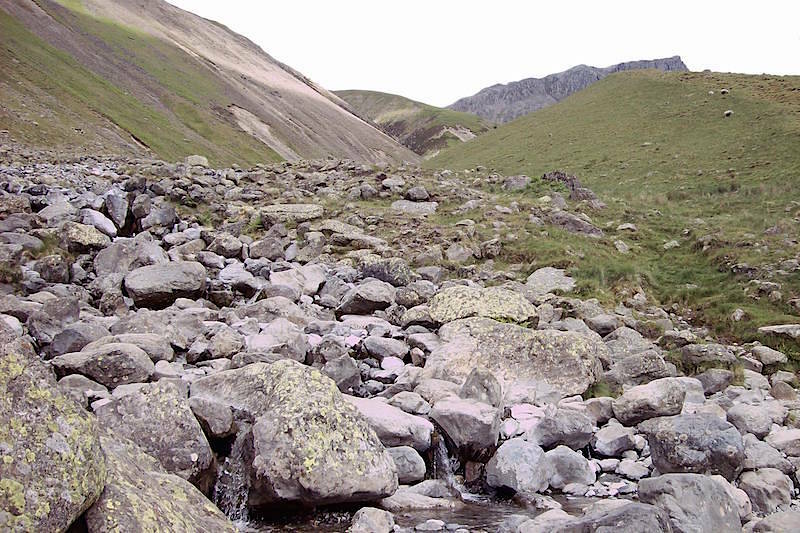 Looking up Lingmell Gill from the point where the path crosses over it, with part of Scafell Pike on the right skyline. 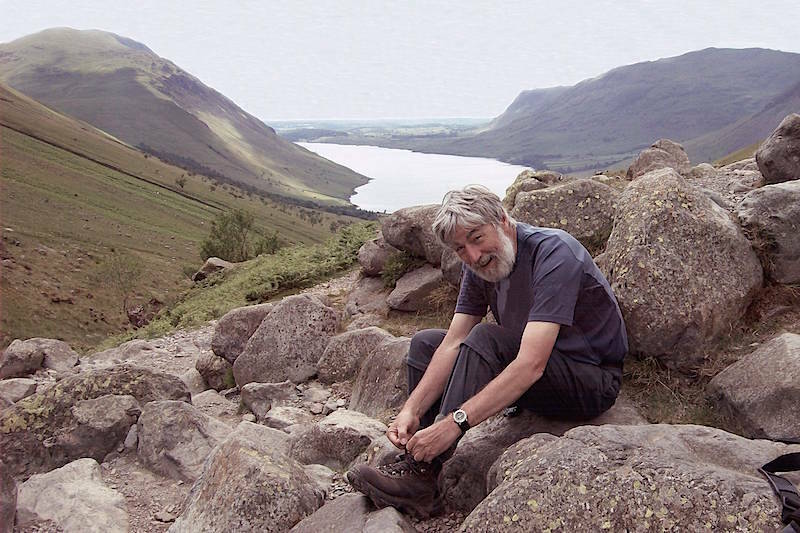 After a bit of cooling foot spa treatment it was boots back on ready for the last leg down to Wast Water …..
….. with just about a mile to go until we’re back at the car.